Apr. 15 (NBD) -- In my mind, I'm going to Carolina. 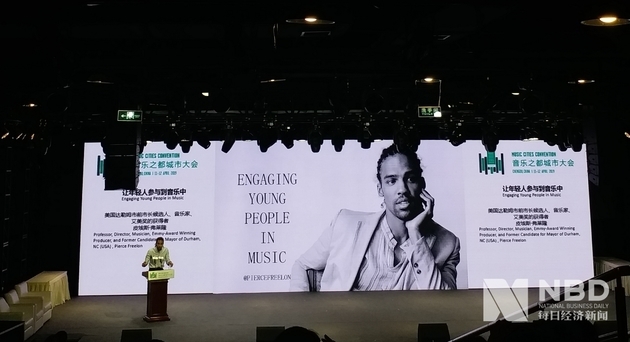 Emmy-award-winning producer Pierce Freelon from North Carolina sang the three lines of folksong lyrics, when he had an exclusive interview with NBD on the 8th Music Cities Conventions held in Southwest China's Chengdu on April 11th. Not only a well-accomplished producer, Pierce Freelon is also a professor, director and former candidate for Mayor of Durham. In 2012, he co-founded and starred in Beat Making Lab, an Emmy-winning PBS web-series. He's the writer, composer and co-director of an animated series called History of White People in America, which was premiered at the Tribeca Film Festival in 2018. He's also the front-man of a jazz and hip-hop band called The Beast. With his rich experience and profound knowledge, Pierce shared his observations about music and the development of the music industry via the interview with NBD. NBD: In your opinion, what's the core value or nature of hip-hop music? Pierce Freelon: Hip hop is a culture, not just about music. It grew out of poverty. It grew up in the communities of New York, especially those in Bronx. It recorded people's stories of how to survive. It relied on art to thrive. There are some other forms of hip-hop culture like break dancing, B-boys, DJ, street graffiti and other visual arts. It's the expression of African-American’s resilience. NBD: According to your observation, what's the current situation of hip-hop music in America? Pierce Freelon: Hip-hop is the biggest music in the country. Over last two decades, it has taken over rock music, country music and pop music as the dominant music. Hip-hop is a popular music, you can see it everywhere in commercials, basketball games and movies, showing the cultural influence of African-American. Furthermore, you can also see people rap in China, Japan and Indonesia. It has worldwide influence. Right now, the U.S. government is sending hip-hop groups out as cultural diplomacy, the same way like we sent Jazz groups out back in the 50s and 60s in 20th century to represent American culture. Today, I see hip-hop keep maturing and evolving. NBD: Are there any new trends and challenges in the music industry of America? Pierce Freelon: I think in this century the biggest challenge is the transition from physical CDs to digital media, from albums sales to streams. So, for artists, record labels, producers, promoters and managers, it's a different way to market their music to fans and communicate with them. You have to become very diverse in the market. For example, producers used to make beats for artists. Now they’re also licensing their beats to ESPN, they're producing soundtracks for video games like NBA 2K. If you don't have access to these multi-streams, it will be difficult for you to cross the lane as an artist. There are new challenges indeed, which is also opening new doors for musicians to create works in more areas. When I grew up, we had video-game composers, beat-makers for famous video games franchise of companies like Sega, Nintendo and Sony Interactive Entertainment. For me, it's an interesting cross-culture collaboration. Hip hop is everywhere. NBD: As an Emmy-award-winning producer, you're making many online TV series. Do you have any experiences or suggestions on incorporating local culture? Pierce Freelon: I think anytime you make art whether it's music or film, whether it's a web series or a Hollywood movie, a documentary or an animation one, the most important thing is to speak with your own authentic voice. For instance, If you're from China, audiences want to know who you are, what your story is and what your own uniqueness is. Stories need to come out from your own cultural background. The more you stick to your culture unique, the more powerful resonance will be among other people. Artists who are speaking their personal experiences about their local community can gain creative cultural strength and combine it into their works. The local identity is quite important, I think. I know in China there are different tones of speaking and ways of telling stories in different areas. I think artists should speak in their own unique voice in the making of art. I know there is a very phenomenal web show called Rap of China. I just listened to some hip-hop music of local rappers like Higher Brothers from CDC. I love their beats. A very talented rapper named GAI impressed me a lot. The Chinese elements in his music are quite attractive for me, such as the story of the Three Kingdoms, the legend of ancient heroes and the authentic local dialects. NBD: What are your suggestions for Chengdu to develop its cultural industry? 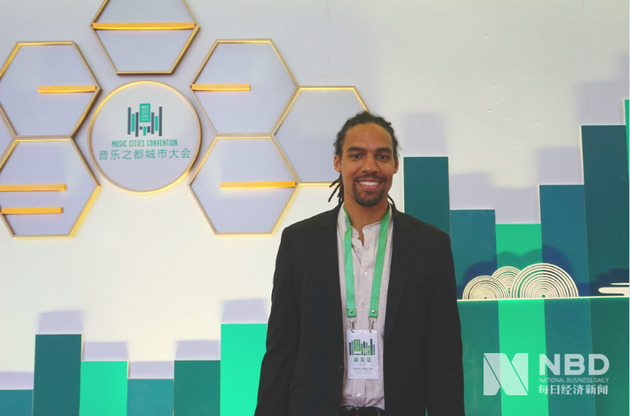 Pierce Freelon: There are many potential consumers in the world that don't have access to Chengdu. On the basis of sound protection of its traditional culture, Chengdu should keep opening more channels to the outside world and facilitate more people to get access to the local culture. NBD: What's your impression of this city? Pierce Freelon: I love the food and people here. I love the vibe here, a city on a high growth trajectory. The visit to the City Planning Museum is quite meaningful. I know there are many national parks and the second national airport is being built. Chengdu has a long history of 4,000 years. This is the land of your ancestors. This is really special for me. I'm African-American. My ancestors were from somewhere else in Africa and lived here against their will at the beginning. Your people have been living here for thousands of years. And you're still growing and still thriving. People here have a bright future. That's beautiful. People here have the cultural legacy which my country doesn't have.